Chameleon: On completing a move, a Chameleon (from classical standard type) changes into another piece, in the sequence Q-S-B-R-Q… Promotion may be to a chameleon at any stage in the cycle. 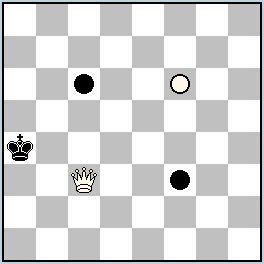 Super-Andernach Chess: Pieces other than Kings change color upon moving with no distinguishing between a capturing and a non-capturing move (or this is a combination Andernach & Anti-Andernach). Maximummer: Black must play the geometrically longest move or may choose from among longest moves of equal length, distances being measured from the center of each square. Diagonal and oblique distances are measured from the orthogonal coordinates by using Pythagora’s theorem (take the square root of the sum of the squares of the orthogonal distances). All other orthodox chess rules apply. Orphan (O): An orphan can move only when observed by an enemy piece; when so observed it can move like the observing piece(s). I wish I could understand why No.408 has no solutions neither testing with Popeye 4.63, nor with WinChloe. 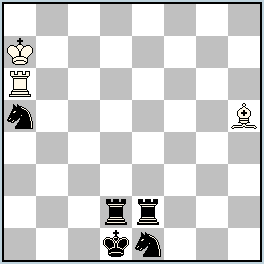 Even the very last move, with stipulation h#1 doesn’t work for the both. Or is there something I don’t see?.. It seems to be a bug in Popeye 4.63. Instead of using “ChameleonChess”, if you make all the pieces (except for the kings) into chameleons, then Popeye finds the solution. And this approach gives also correct solution on WinChloe! -with the both options: either with Andernach & Anti-Andernach or with just one Echiquier magique! Happy to see the problem is really C+! Thank you, Geoff! Applies equally to Neutral pieces also !